The problem is, behavioral issues can certainly be frustrating, especially if your parrot has a very annoying habit like screaming. The most important thing to remember when you are addressing a behavior issue in your parrot is that you absolutely must be patient. You cannot allow impatience or frustration to show through when you are working with your parrot. If you do, you could actually make the issues worse or you could cause your parrot to develop more behavior issues. Always remember to be patient. The next thing you need to do is determine why your parrot has the behavior issue. In most cases, you should be able to pinpoint the problem. For example, some parrots develop the habits out of stress. If your parrot is in a loud or disruptive environment and it is constantly under stress, then will be able to address the behavior problem by removing the stress factors from your parrot’s environment. Sometimes, behaviors can be out of boredom. If you notice that your parrot seems to develop the habits when you are away at work, it could be bored or it could even be suffering separation anxiety. In these cases, you will need to make sure you provide toys to stimulate your bird’s mind and spend plenty of time with it when you are at home. In extreme cases of separation anxiety, then you may want to consider having someone stop by to check on your bird during the day just to keep it from continuing to develop the habit. Sometimes, parrots develop behavioral problems simply because they realize they will get attention if they are loud or do something to get noticed. If you feel like your parrot is simply looking to get your attention, you can easily solve this behavioral problem. When it screams or performs the behavior, simply ignore it. Act like you did not even notice and soon the bird will realize that it will not get the attention or reaction that it wanted. 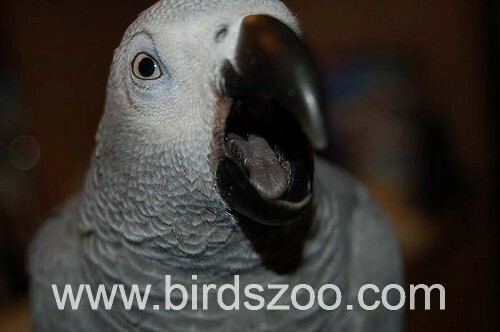 When you are addressing behavior problems in your parrot, make sure you do not yell at it or try to intimidate it. When you do this, you will actually make the bird fearful. If you instill fear in your bird, then it will harm the relationship between you and your pet. A fearful bird is more likely to develop even more behavior problems as well. Is my parrots behaviour normal? At times you may feel as if your parrot is acting weird or demonstrating odd behaviors but some of these actions are perfectly normal for your parrot. For example, you may notice your bird bobbing its head or grinding its beak. This is no cause for alarm. Your parrot is just acting the way it should. Below is a list of other behaviors that are common for parrots. Although some of these actions may be unwanted they still are common nevertheless. Biting may occur for several reasons. This first reason may surprise you. If you are in the presence of a stranger and he bites you, this is an instinctive flock behavior and it is meant to defend you. 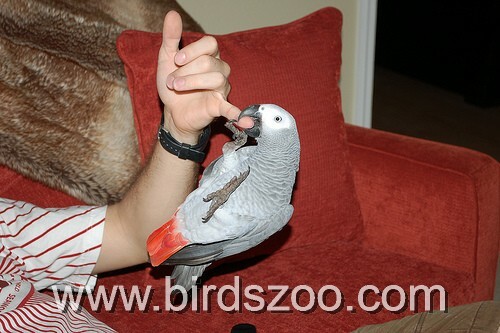 Next, biting may be a common behavior, although not desired, if your parrot is trying to control its environment. This is a way to challenge you and gain control of his surroundings. Finally, biting may occur if your parrot is simply exploring his surrounding or an object with his mouth. All parrots will chew. In the wild, birds use their beak build nests or modify a hollow tree. Chewing and gnawing is the most common behavior. It is imperative to provide the proper toys and supplies to satisfy this impulse. If you do not supply your parrot with chew toys of other outlets you will find that he will meet these needs by gnawing on your furniture, plants or other household items, such as electrical cords. Chewing is a natural way for your parrot to keep his beak in top condition. It is a normal behavior for your parrot to rest or sleep on one foot while the other foot is pulled up into the belly feathers. However, if you notice your bird always using both of his feet to sleep and perch, you need to make your veterinarian aware immediately as this may be an indication of a health issue. Birds will go from a calm state to clasping his cage and stretching its wings and legs. They will appear to be mimicking an eagle lifting both wings at the same time. A little wing expanding is a normal behavior for all birds. Parrots often have a tendency to grind their beaks as they are falling asleep; this is a sign of a relaxed pet bird and is a normal behavior as well. Parrots will appear to be yawning from time to time by opening their mouths wide. This may be a way that your parrot is showing you it may need more oxygen in his environment and it is recommended that you air out the room or area that your companion is in. Or it may be that your bird is just stretching muscles. There is no reason for concern, unless accompanied by other signs of distress. Your parrot will let you know when some tender loving care is needed if you do not provide it with enough. You will hear and see behaviors such as screaming, sneezing, chatting, singing or shaking toys. This is a normal and effective way to get your attention. It is not unusual for your parrot to wipe his beak on cage bars, perches, or you; this is a method the use for cleaning their beaks. Birds love to play in the water and are great bathers. The water should be lukewarm before your bird gets in it and it is important to make sure he is completely dry before he goes to bed to prevent him from getting chilled. Bathing also provides great comfort for your bird. 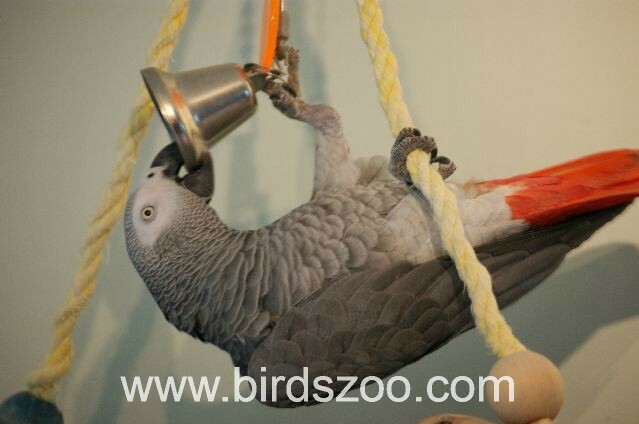 Whether you provide a light shower under the kitchen sink, a bowl of water to splash in or let your companion shower with you; you will realize rather quickly the excitement and joy your parrot experiences from bathing. Sometimes parrots will charge or lunge, if you will, at their human companions and strangers. Although this action is undesirable, it is often a common behavior of parrots. The best way to react to this is to not respond. By responding, your parrot thinks he can be threaten and control his human this way. Do not react and you will see the behavior fade over time. A parrot’s pupils will contract and expand when it sees something that excites or is of interest. This is called eye pinning. You can see this characteristic on some parrots better than others varying on the type of bird due to the color of their irises and how much they blend with the pupil in the eye. But this is a normal behavior never the less. Parrots will vocalize, but birds who feel or are neglected tend to become screamers. Once a bird becomes a screamer, it can be a difficult habit to break. Birds may also scream if they become frightened, feel they need to protect their household and family members; some are even known to scream with they are tired. Nevertheless, at times your bird may want to reassure he is not alone and will scream. Just let your companion know you are there and comfort him. In most cases, the bird will be content with this and quiet down. This behavior relieves a bird’s tension or it is often the start of the preening process; but, if you bird fluffs up and stays that way, contact your veterinarian as it can be an display of sickness and needs to be addressed. Hormonal aggression is a common behavior in Amazons. This is a phase that begins to show between the ages of 5 to 11 years of age. This means that during this phase there will be a time span that last a little over a year where they are very aggressive. A bite from a hormonal parrot can be ferocious but do not be alarmed at this time; usually after your parrot passes this phase they show little or no aggression outside the breeding season, this is normal behavior. Your bird will spend most of his time preening his feathers. He will straighten and clean his feathers everyday to maintain his well- groomed appearance. He also lubricates his feathers with the oil he gets from the gland at the base of his tail. This is necessary for your bird to do to keep his skin from becoming dry. Do not be alarmed if you notice him picking or biting his tail. Birds will preen each other as well. It is natural behavior for birds to regurgitate for their mates during mating season and while they raise their babies. It is a sign of affection and love. When your companion regurgitates you will notice pinning of the eyes, thrusting of the neck muscles and head bobbing right before he regurgitates the food. To prevent your bird from becoming stressed it is important to keep a consistent routine with their routine and surrounding. Stress can do damage to your bird’s health. Parrots are habitual and do not adjust well to sudden changes. Stress has many symptoms that can include rapid breathing, loss of appetite, feather stress and picking, insomnia, squawking, diarrhea and fanning of the tails or wings. Again, try to maintain a steady schedule, plenty of attention and healthy diet to lessen the chance of stress in your bird. Birds require many hours of sleep a day. This amount of sleep may be perfectly normal for you to understand. However, there are some unusual behaviors that parrots have while sleeping that may be surprising to new bird owners. You may see your bird snuggling with or under something while sleeping or sleeping on their backs with their feet in the air. Although these behaviors may alarm you, your parrot is comfortable and relaxed and there is nothing to worry about. Provide your companion with something to cuddle so they will enjoy their sleep time. You may also see him standing on one leg with the other one tucked in his belly feathers and his head may be facing in the rear position. Again, this is perfectly normal and comfortable for your parrot. In the wild, parrots can fly away from threatening situations, but occasionally, you can witness this kind of aggressive chasing / lunging in wild birds. Many of us have seen brave little birds chase hawks and other bird of prey away from their nesting site. If fleeing doesn't work, they are proactive in chasing away a perceived threat to protect their young. In captivity other types of "lunge biting" have developed. In addition to territorial, aggression and protective lunging, some parrots have learned to entertain themselves by lunging at people; the reward being the dramatic reaction as the human panics, turns, runs away, maybe shouting and thrashing their arms around. In the eyes of the bird, this makes for great entertainment and, therefore, encourages lunging behavior. Territorial Defense: Some parrots, particularly the Amazon parrots, are especially known to lunge at a person that the bird perceives as a rival for its person's affection. The bird may encourage such individual to come over, appearing to be friendly and attention-seeking, but as the person responds and comes over the parrot lunges at him or her, often biting. Jealousy: A bird attacks what he or she perceives to be his or her rival. Rough Play: Some owners unwittingly encourage and train their birds to display this behavior by playing rough with their pets. Rough play encourages biting and establishes very bad habits that will be difficult to break. Protection: Some times lunging can be a mate protection issue. This parallels the behavior described above of birds chasing away predators from their nest; or a parrot may feel their mate or human favorite to be in danger and may lunge to protect them. Aggressive Biting: Initially governed by a bird's instinct to defend itself, the reward they get is the extra entertainment in form of the dramatic response by the person they are lunging at. This is how the instinctive aggressive lunge to protect itself, may turn into a habit that is challenging to break. Summary: In going over the reasons for lunging, you will see again and again that the dramatic response by their victim / perceived playmate that follows a lunge is really what drives this behavior in most cases. Stop the Lunge Biting:The most common and worst response is anger or even aggression. Aggression will often result in more aggression from the bird. Anticipate This Behavior and Prepare: Identify the events that trigger that behavior. Knowing when it happens, allows you to prepare. If you feel more comfortable, hold a cushion in front of her and ring a noisy bell to startle her. This usually stops them in the tracts. Identify what situations create this behavior and prevent them from occurring. An example of this would be territorial lunging caused by perceived intruders getting too close to a parrot's cage. The best cause of action is to move the cage out of the traffic path; placing the cage or play gym in a more protected area. This being said, it is important that the cage is situated in the area where the family normally spends their time. Parrots are social animals and need to be part of a family -- they shouldn't be placed in a spare room with little attention. Find a protected area in the family room (if this is where the family usually is), however out of the path of traffic. Taking a parrot out of the traffic area has effectively stopped lunging in many cases. Time-outs: Taking away privileges is one way of letting your bird know that this behavior is not acceptable. This punishment has to be applied consistently. This is the key. Your parrot has to understand that the punishment, such as time-out, will be a result of lunging. Note: A time-out should not be placing the parrot in the cage for the rest of the day. Place the parrot into his cage for about five minutes and then give the parrot another chance. Schedule daily training sessions lasting half an hour or more a day. The parrot should be given out-of-cage time and should be rewarded for good behavior, undesired behavior resulting in time-outs. Being calm throughout is important. Shouting and anger is counter-protective. Do Not Reward Lunging with Drama: If you at all can, learn not to flinch from a lunging bird or acknowledge a sneaky bite. Immediately after the bite, place him in his cage. Addressing Jealousy Issues: If there is a person in the house who is particularly at risk of being lunged at, they may want to spend some time gaining the bird's trust - offering a treat and talking to him or her softly would be one way to do so. As you approach the cage, do not come closer than the parrot is comfortable with. You will see his body posture change if he feels threatened. Go as close as you can, offer a treat from afar ... go closer if he seems more comfortable. Don't be impatient. A little session every day should eventually change the dynamics of the relationship. All parrots will get hormonal at times. This is a normal natural process. The challenge, however, is greater with some parrots than with other species. Females are usually calmer than males during the breeding season. An attack by a hormonal male can be vicious and will not be limited to one bite. The time of aggression varies with the individual bird. It usually appears between the ages of 5 to 12 years. During this time there will be one to two years in which they will be very aggressive. Once they go through this, they generally settle down with little or no aggression shown when they are not hormonal and some aggression when they are.Bird owners may find that their pet all of a sudden turns on them and favors another family member.Understand that this is a natural behavior. 1.Birds acting overly sexual in response to being petting (especially on the back or wings). 3.Frequent regurgitating of food, panting, crouching down with wings dropped. 7.Possessiveness of favorite human (or bird companion) - while being extra aggressive toward others. Hormonal behavior is perfectly normal and a pet bird should never be punished for this natural behavior. However, there are ways to minimize hormonal / sexual behavior in birds. Stick-train your parrot. This is very important. You don't want to handle a hormonal parrot, as they can bite very hard. T-perches are great. They are difficult to find. It has a long handle, so I can retrieve my parrot from high-places. These perches look like a "T" -- with the upper "line" being the perch for the parrot to step on, while the lower part of the T - the vertical line - is the handle. This way, the parrot can't easily get to your hand. If you use just one simple straight perch, they can move over to your hands and bite. It's easy enough to make such a "T" perch yourself. Stick-training is a natural process. Simply pushing the perch against the parrot's tummy will prompt them to step up. Always accompany the action with the words "step-up" or "get up" or "up" - whatever you like. This way the parrot knows what is expected. Decrease the amount of light your bird gets everyday. Ensure that your pet is getting 11-12 hours of darkness per night. Limiting the amount of daylight and / or artificial light the bird receives. If you cannot sufficiently darken the room the bird is in, then put a dark cover over the cage. Remove access to any chosen "nest site." Deter your bird from actively seeking a nest or building one. Provide foraging opportunities and bird toys.Try changing the "scenery," like moving the cage to a different location. The motivations of an adolescent Grey who is biting are not at all the same as a baby Grey who is biting. From my experience, bite/nip more as an experiment. It is doubtful that they understand that their beaks can cause pain—they are more simply trying out various methods of interacting with the world and their human caretakers. This stage, often laughingly called the teething stage, could probably be likened to small children who pinch. A tragic scenario is often acted out during this stage. The bird is learning to explore with its beak and sooner or later, it encounters those wondrous things called human fingers. If humans make the mistake of using their fingers as toys in the bird's mouth, sooner or later the baby will bite down harder than the owner of the fingers might like. If the humans respond to this accidental nip by yelling (as in "OW, NO BITE!!! "), then they have inadvertently taken the first step towards actually teaching their bird to bite. Why, you say? Because parrots really seem to ENJOY it when humans yell at them. Since they often scream simply for the fun of it, it is fallacy to think they perceive yelling as a reprimand. On the contrary, they seem to interpret yelling as positive feedback. This is what is known as the Drama Award. So the baby parrot will nip again, since the human inadvertently rewarded it for nipping. Sooner or later, the experimental nips will actually hurt the human (physically as well as emotionally), and the human’s response becomes something like "YOU BAD BABY, YOUR MOMMY (and daddy) LOVES YOU. HOW COULD YOU BITE YOUR MOMMY?" The baby hasn’t a clue as to what is going on, as it thinks this is a fabulous new game. You know, grab a finger and your pet person makes lots and lots of wonderful noise! This scenario generally happens when inexperienced owners are not clear in their signals to the parrot. For example, when offering a hand for the bird to step up, novice owners often aren’t quite sure of themselves....so their hand motions are uncertain. The bird may wish very much to climb on, but like a workman unsure about the stability of the ladder, it reaches with its beak (which in this case is functioning like a hand) to steady the human perch. Humans who are afraid of that beak generally respond by pulling their hands away. Now, the bird is REALLY confused. The next time the human’s hand is offered, odds are very good the bappy will grab fast with its beak----after all, it doesn’t want the hand to go away before it has the chance to climb on----and the human jerks away. If this scene is repeated, and it generally is, the bird will learn that its beak is a source of power—that it can make its human go away. The bird doesn’t really want its person to go away, but it’s lots of fun to be in control, so the behavior will happen again and again. Once again, the baby has no idea that it has done anything wrong. 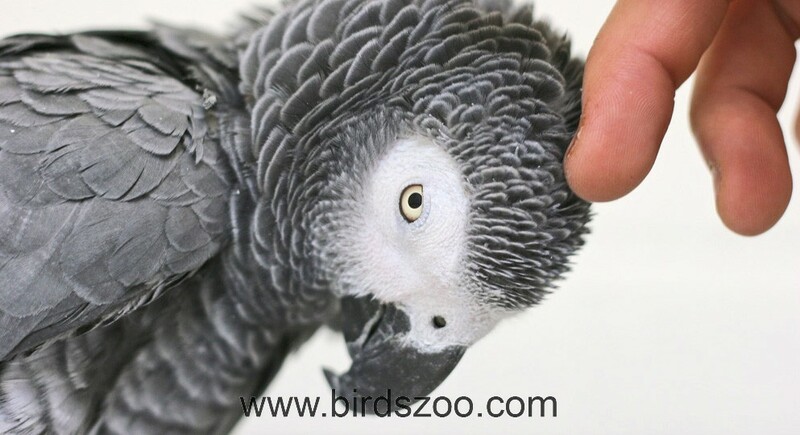 If humans are afraid of being bitten, they will often unconsciously pull away when a Grey (or any other species of parrot) reaches with its beak. In this manner, the bird learns to use lunging and biting as an effective technique with which to control humans, and that bird will remain in control for as long as the humans remain afraid. Parrots can sense when someone is frightened and will take advantage of it every time. If people cannot get over their fear responses, then they will probably never gain control over their birds. This is generally what happens when normally well-behaved Greys nip a new person to whom they’ve just been introduced----your new boyfriend, for example. The bird senses the human’s fear and responds to it. When you think about it, it makes a great deal of sense. Here is an intelligent young parrot who weighs approximately one pound, who is being encouraged to step onto the hand of a 150 lb human who is, as far as the empathetic parrot is concerned, radiating waves of fear. In that situation, I would bite too. So what else DON’T you do? You don’t under ANY circumstances use violence against a bird. If you do, even if you don’t physically harm him, you risk doing permanent damage to your relationship with him. Generally speaking, parrots don’t apparently use violence against other flock members in the wild, so your Grey simply will not understand your use of violence against him. Odds are good he will never be able to trust you again. There is much outdated and incorrect advice being given to people about biting parrots. People are often told to grab the bird’s beak, shake it and yell NO! This does not work because we have now realized that grabbing a parrot’s beak ("Beak Wrestling") is considered to be play behavior between parrots, plus the drama reward of our yelling. So once again, in our efforts to give negative feed-back to parrots, we have only succeeded in rewarding them. It also doesn’t usually work to punish by putting the bird in its cage, because by the time you get him there he’s probably completely forgotten the connection between biting you and being locked up. Yes, African Greys are intelligent, but we’re talking about an intelligent human two year old, here—not an intelligent adult. Obviously, he can’t bite you again because you’ve removed him from the vicinity, but you haven’t taught him anything about NOT BITING. Enough of this stuff about all the things that don’t work—just what exactly does? Actually, it is quite simple. If you have already established a relationship of Nurturing Dominance with your Grey, then he already perceives you as head of the flock, and he is already trained to step onto your hand when you say UP. First, show him your displeasure by giving him a REALLY DIRTY LOOK— I’m really serious about this---- you have to look at him as if he were the lowest of the low, or pond scum, or something you might find stuck to the bottom of your shoe. Parrots are extremely empathetic creatures who watch our facial expressions closely. He will understand your displeasure if you give a tremendously dirty look. Then, make him step from one hand to the other over and over, while you keep saying UP in a very firm, but not loud, voice. Do this several times in a row and you will be amazed at the difference. This is a non-abusive, nurturing technique with which to give a parrot negative feed-back because psittacines really understand this as a reprimand. We call this technique "Laddering" and it is an exercise in control---- reminding your Grey that YOU are the alpha in the flock, NOT him. If you are firm and consistent, reminding him of this will put him back under control. And without the positive feed-back that he inadvertently received before, the biting should end. When dealing with a baby Grey in the Teething Stage, it is also quite simple. When the baby bites too hard, say NO in a firm voice and give the baby a DIRTY look. The bird will understand that you are unhappy and will try very hard not to do it again. Under NO circumstances should you yell. 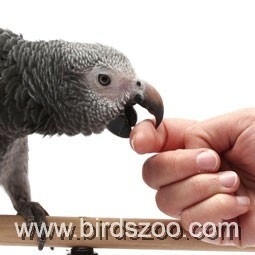 Biting behaviors are commonly seen at various stages of psittacine development, and African Greys are no exception. However, this stage can and will become permanent if it is not handled correctly. It is important for baby Grey owners to understand that. Waiting for a parrot to "grow out of" an unwanted behavior NEVER works. Also, the longer the behavior is allowed to continue, the longer it will take to eliminate it. The good news is that from my experience, the establishment of clear, consistent controls through the use of proper training works every time. 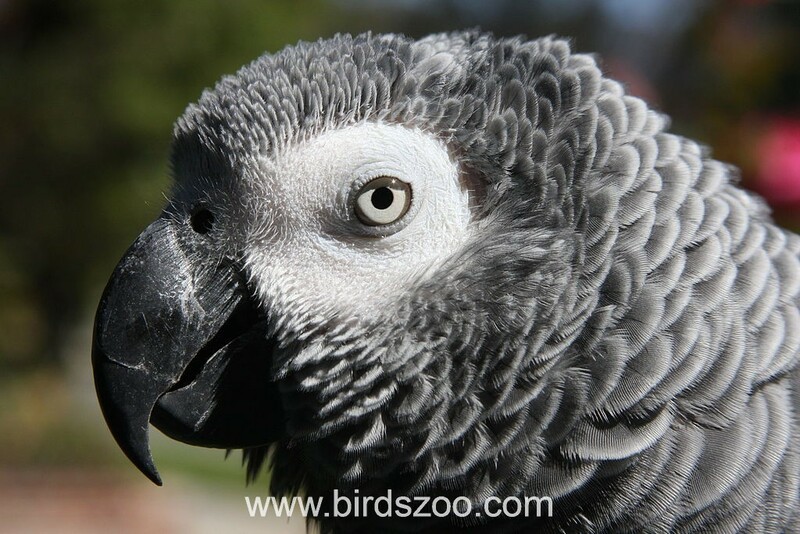 And an African Grey that is well-behaved is truly an exquisite companion! Many of us have heard that a parrot can be hormonal. This seems to be a catchall explanation for everything from biting and screaming to the parrot suddenly becoming Velcro when it was independent before. What are parrot hormones really, and what can we do about them? Spring is in the air, and suddenly a parrot instinct kicks in, its time to mate. It might not be spring outside your home, but you could be copying the conditions of spring right inside your home. Longer hours of sunlight, warmer temperatures, these things signal to your parrot that it is time to breed. Breeding parrots behave differently than those who are not in this cycle. These changes can catch a person off guard, especially when you have raised your beloved parrot from a baby; suddenly you have Mr. Hyde on your hands instead of Fluffums. This is part of natures plan for the parrot species, and living with other animals cannot really prepare you for what it's like to live with a parrot who feels the need to breed. Although each different kind of parrot displays a different level of hormonal behavior, they do each experience it to some point. Even the small Budgie might be a bit moody at this time of the year. 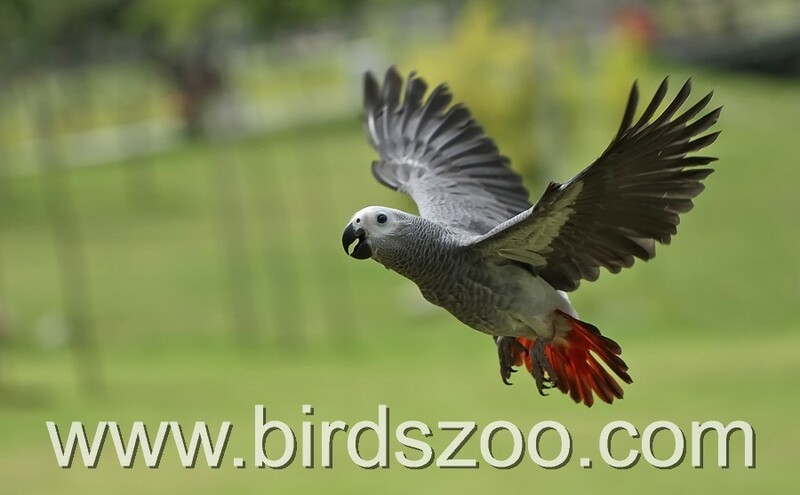 For example Amazons and Cockatoos might become extremely aggressive during the mating season, while an African Grey might show very little in the way of hormonal behavior. What people need to understand the most is, while some parrots may breed only in spring, many parrots will breed all year round thus behavior may change randomly throughout the year and become unpredictable at any time due to breeding hormones. 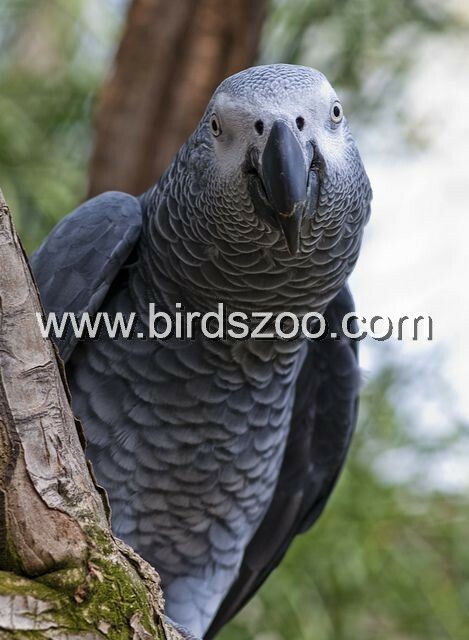 An African Grey parrot is one of those known to breed year round, and many who share their lives with these beautiful birds understand that they can go through moody cycles more often but of far less intensity than their Cockatoo cousins. So what can we do while our parrots are in hormonal flux? The easiest thing for us is to limit sugars and starch while our birds are exhibiting breeding behavior. Feeding a parrot a lot of grapes or corn on the cob while it is hormonal is a bad idea because those foods help to increase the hormones rampaging through your birds body by tenfold. We also need to be aware of the effect our touch has on our parrots. While we enjoy stroking and petting our companion birds, sometimes our touch can over-stimulate an excited bird who is looking to breed, causing biting and screaming as a reaction from the bird. Remember that birds have been known to cuddle each other in the wild while courting, and our cuddling our birds is easily interpreted as mating behavior by the parrots. This does not mean that we should all stop touching and loving on our parrots, only that we should be aware that during hormonal cycles it is best to limit our stroking to safe non-sexual areas of the parrots body, like the top of the wings. We also need to take into account that parrots will protect their nest and mates from all intruders, and in a companion parrot situation the mate usually becomes one of us. Often times the nest becomes the cage, or playstand, or other area that the bird spends a good deal of time. Be aware that a hormonal parrot may very well attack any intruder who dares near its nest or mate, meaning your wife or husband, children or pets. This is not an aggressive behavior in the parrots mind, but simple protection of its future children. Even though it is impossible for our parrots to mate with us their instinct says that we must be protected in order to protect possible offspring. The easiest way to avoid these attacks is not to let others touch you (if you're the chosen mate) in the parrot's sight, and not to let anyone other than the chosen mate clean or do anything else near the chosen nest area. Remember, you being the chosen mate does not mean you will not be bitten, the parrot may very well bite you as a warning that another "potential mate" is close, and these bites can be devastating. Never allow a hormonal parrot on your shoulder, the facial bites reported when this happens are often horrific and devastating. Any parrot can become hormonal, and many behaviors that seem to have no other reasoning can often be attributed to hormones. Each bird species has its own hormonal personality and should be treated properly. With love, respect, and understanding you and your parrot can come through mating season with your relationship intact. Parrots are both caring and intelligent creatures, which makes living with them interesting. Parrots can make amazing companions because they often become very attached to their owners. However, this attachment can also cause problems, such as jealousy. Parrots often become jealous of other birds or people who are receiving attention from their owner. Jealousy can make parrots actout, often aggressively. You can't train jealousy out of parrots, but there are several ways you can alleviate the situation. One of the most common signs of a jealous parrot is nipping. Parrots nip in order to get attention. Therefore, although a jealous parrot may nip the bird or person it is jealous of, it's generally the owner of the bird who is bitten. Jealous parrots also become very loud, often screeching or calling out at the object of their jealousy. Some jealous parrots also begin to pluck out their feathers, which is a truly bad habit in parrots that, once begun, is incredibly difficult to stop. Jealousy can also cause stress in birds, which can lead to health problems and more severe behavior problems. When a new bird or person is going to be living in your home, it's important to prepare your other birds, then correctly introduce the newcomer in order to limit jealousy. When introducing a new bird, let your parrot watch you setup the new living area. Talk to an imaginary bird or person while your parrot is with you. Parrots are very intelligent creatures, and will understand that this means someone new will soon be in the house. Introduce the parrot to the new bird or person slowly, without forcing them on each other. Ignore negative behavior and praise positive behavior, making it clear to your bird that you are in charge and will not tolerate negative behavior. 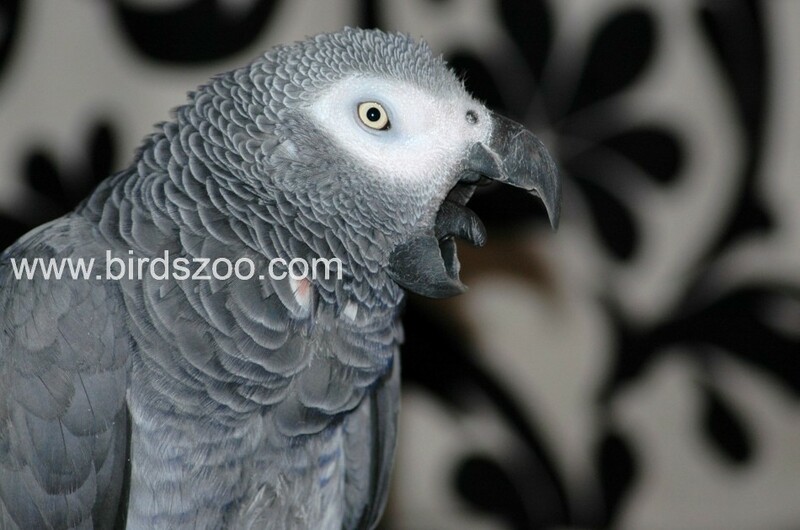 When bitten or screeched at by a pet parrot, the first reaction is often to lash out by yelling back at the bird. However, these reactions will only encourage the negative behavior. Yelling only makes the parrot think it is getting attention. If the bird thinks it is receiving attention for its actions, it will repeat them. Instead, when the bird screeches or nips, simply ignore the bad behavior. This lack of reaction will tell the parrot that the behavior is not effective, and that there is no reason to continue it. Positive enforcement is not only enjoyable for both you and your bird, but it is one of the most effective ways to limit jealousy in parrots. When the bird or person the parrot is jealous of is around, lavish affection and treats on your parrot. This attention makes the bird or person a source of pleasure instead of jealousy. If your parrot is jealous of a person, have the person give the bird attention and treats, which creates a positive bond instead of a negative one. "HEIGHT DOMINANCE" is a term that has been around for ages. The idea is that a parrot on your shoulder is now at or above your eyes and therefore will try to dominate you. Well, it simply isn't true. First of all, parrots don't live in dominance-related hierarchies. They live in pairs or family groups, which may or may not congregate in a larger social group in a roost tree or at a feeding site. While a nervous bird will be inclined to climb to the highest point it can, it isn't because it wants to dominate a situation - it simply is seeking safety. For a bird, up is the way to safety and therefore a good place to go to find comfort as well. A parrot's beak is made of keratin, just like human fingernails. It has two basic parts the upper and lower mandible. The mandibles are hinged to the parrot's skull which gives the upper and lower mandible separate vertical movement. Their beaks grow continuously so parrots need constant sources for chewing to help wear down their beaks and keep them in good condition. Parrots can produce a lot of pressure when pressing the upper and lower mandible together. Cracking nuts is as easy as pie. Birds communicate using vocal skills and body language. Beaks are used to explore their surroundings and environment. Parrots also use their beaks as a third foot to grasp, to climb, to step up, and to hold nuts or toys. 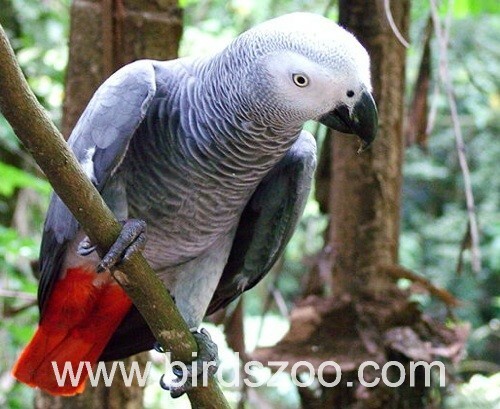 Some of the things that can make parrots feel threatened or nervous are: invading their territory,. strangers (lack of trust), changes in their environment, disturbing them when attention is not wanted, unexpected noises, sudden movements, jealousy, negative reinforcement (which has become a habit), abuse, or neglect. Another common reason that causes birds to bite is protecting their mate. If your bird has chosen you for a mate and your bird perceives impending danger, he/she may bite you to try to chase you away from what he/she perceives as a dangerous situation. Your bird may feel that unfamiliar people, new birds, or new pets pose a threat to your safety. In these situations it is best to slowly introduce your bird to the new person, pet, or object, giving your pet enough time to accept and adjust to the change. To prevent your bird from biting, you need to learn and understand your birds personality and moods. Learning when they want attention and when they need privacy will help prevent from getting bitten in the first place. Exposing birds to change on a regular basis will teach birds to be more trusting of new objects, new people and unfamiliar sounds. Most young birds go through a stage where they are exploring their surroundings and learning about their environment. During this stage birds are learning how to use their beaks and don't realize the strength they possess. It is important to teach birds not to bite during this time. During this time do not allow your bird to nibble on your fingers, ears, or other body parts. Juvenite birds who were handfed may still think "fingers" are food. Newly weaned birds may be gentle when nibbling on your finger but can bite considerably harder as they grow up. Be consistent, otherwise your bird will be confused when he/she is suddenly not allowed to nibble on you anymore. When birds try to nibble on you give them an acceptable alternative to chew on and in a firm voice tell them no. Offer them a carrrot, apple slice, foot held toy, block of wood, piece of leather, etc. to chew on instead of your fingers. If the toy or food doesn't distract them from your fingers, gently blow in their face and say NO. Some birds learn really quickly not to bite while others may take a few weeks. If blowing in your bird's face and, firmly saying NO, doesn't stop your bird from biting within a few weeks, then you can try "time out periods" . Immediately after being bitten, firmly tell your bird NO, and put your bird in his/her cage or other designated area of the home, carrier, cage, or playstand for a "time out". Completely ignore your bird during the entire duration of the designated time out period. Do not interact with your bird verbally or visually. After the time out is over, begin to interact with your bird and reward your bird for desired behavior with praise, head scratches, or a favorite treat.